Fall Rice, Grains and Beans :: Oracibo.com - Food, Travel, Design and Cooking! An old favourite of mine; excellent served with roast pork loin, especially a juicy, bone-in roast . I also use it as an accompaniment to my hazelnut chicken breasts and anything else that takes my fancy! Like I said before, I love barley. If I have leftovers, they will become part of a soup. You can easily make half the recipe if you like. Melt butter in a heavy ovenproof casserole over medium-low heat. Add leeks & celery & cook until soft, stirring occasionally, about 6 minutes. Add barley & stir 3 minutes. Add bay leaves, thyme, salt & a generous amount of pepper. Mix in stock & wine. Bring to a boil; cover tightly & bake until liquid is absorbed, 35 – 40 minutes. Stir in parsley & chives. Serve immediately. Joe likes it! That’s what the note at the top of the recipe says! The polenta is prepared in the microwave then finished in the oven. I think it would be excellent with chicken, perhaps Joe’s Tuscan Chicken or chicken with barbecue sauce & a nice salad. In a 2 – 3 quart microwaveable casserole with a lid, microwave the bacon, uncovered, on high, stirring after each minute, for 2 to 2 ½ minutes, or until it is almost crisp. Pour off all but 1 Tbsp. of the fat from the casserole & stir in the onions. Microwave the mixture, uncovered, on high, stirring every 2 minutes, for 8 minutes, or until the onions are softened but not browned; transfer the onion mixture to a bowl. To the casserole add the water, broth & sage; whisk in the cornmeal, a little at a time, whisking until the mixture is smooth. Microwave the mixture, covered, on high, whisking after 3 minutes, for a total of 5 minutes, or until it is thickened & the liquid is absorbed. Stir in the butter, 2 Tbsp. of the cheese, half the onion mixture, salt & pepper to taste; divide the mixture between two gratin dishes or spread into a 3 cup gratin dish that has been buttered or sprayed with non-stick cooking spray. Top the polenta with the remaining onion mixture, spreading the mixture evenly, sprinkle it with the remaining 2 Tbsp. cheese & bake in the middle of the oven for 15 minutes, or until the cheese is melted. Known as orzotto in Italy, this is a delicious change from regular risotto. The orzotto would be great made in the early fall as well, when we can still get local zucchini. I have substituted leeks & peas for the zucchini & carrots too, adding a few tablespoons of snipped chives & perhaps a bit of fresh mint in the spring. The barley needs to be soaked for 8 – 12 hours, so do that on the morning you plan to make your orzotto. In a bowl cover the barley with water by 2”. Soak for 8 – 12 hours. Drain in a colander, set aside. In a large saucepan, bring broth to a simmer & keep it at a simmer, lid on. Finely chop onion; dice zucchini & carrots. In a 5 quart heavy kettle, cook onion in 2 Tbsp. butter over moderately low heat, stirring, until softened. Add the barley & the wine, stirring to combine. Add 2 cups of the simmering broth & cook at a slow boil over moderate heat, stirring frequently, until thickened & some broth is absorbed. Continue to add the simmering broth, 1 cup at a time & cook, stirring frequently, letting each addition be partially absorbed before adding the next, until about half the broth has been used, over a period of about 20 minutes. Stir in the zucchini & carrots, continue to cook, adding broth ½ cup at a time, in the same manner until barley is tender, about 20 minutes. Mixture will be a bit soupy but the barley should be mostly tender but not mushy, (just slightly al dente). If not, continue cooking, stirring longer until it is, adding more broth if necessary. This may take up 10 – 20 minutes longer. When done, stir in the Parmigiano-Reggiano, remaining 2 Tbsp. butter, parsley & black pepper until incorporated; remove pot from the heat. Let orzotto stand 5 minutes before serving. 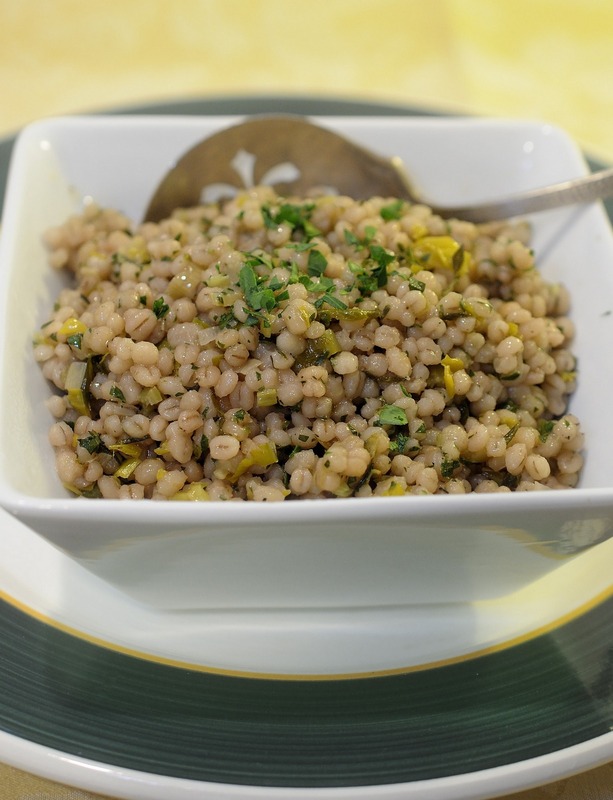 There’s something so yummy & comforting about barley no matter how it’s cooked! A couple of months ago at a restaurant in London, I had a “rice” pudding made with barley instead of rice. It was wonderful! I could eat it every day for breakfast but it would be a guilty pleasure if I did. The first chives are up before winter is over; nice to use them here. Unfortunately fresh basil will still have to be bought for now! Bring broth to a simmer in a medium saucepan. Reduce heat to low; cover & keep warm. Melt 2 Tbsp. butter in a heavy large saucepan over medium heat. Add the onion ; sauté until tender, about 6 minutes; add the garlic & sauté for a minute further. Add the barley; stir until coated with butter, about 1 minute. Add ½ cup broth; simmer, stirring often, until broth is absorbed, about 3 minutes. Add remaining broth ½ cup at a time, allowing broth to be absorbed before adding more & stirring frequently until barley is tender but still firm to the bite & risotto is creamy, about 45 minutes. Place serving bowls in a preheated 180 F oven to warm. Meanwhile, melt 2 Tbsp. butter in a medium skillet over medium-high heat. Add the mushrooms & sauté until soft, about 5 minutes; season to taste with salt & pepper. Add the mushrooms, Parmigiano, herbs & remaining 2 Tbsp. 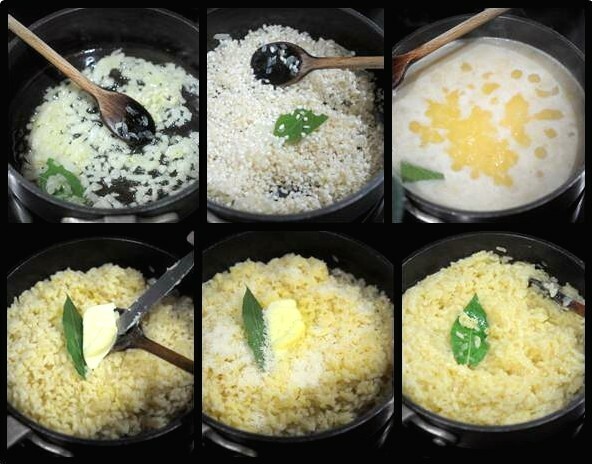 butter to risotto; stir to combine; season to taste with salt & pepper. 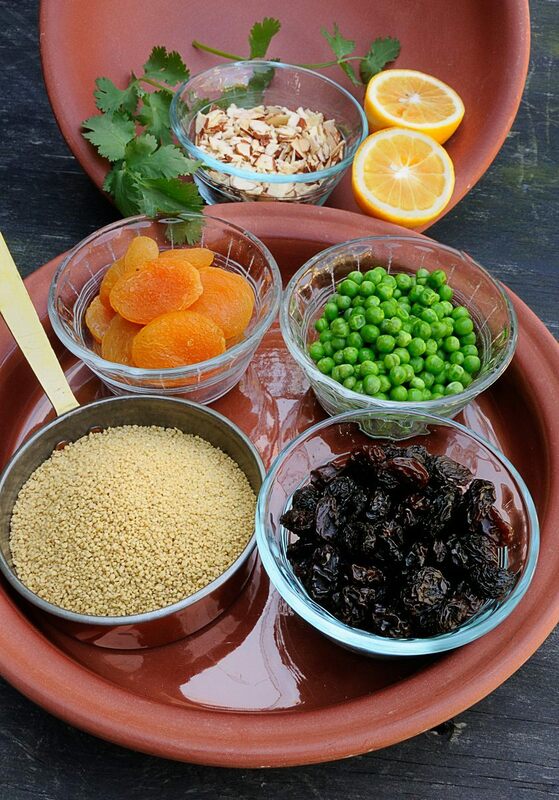 Place into warmed, individual serving bowls & serve. This is an excellent “risotto” made using farro. It is terrific in the winter or fall as a first course, perhaps followed by a roasted bird or meat of your choice. Heat the stock in a pot until hot. Cover with a lid & keep warm on low heat. Heat the EVO & butter in a medium sized pot & add the shallots. Sauté until translucent, add the farro & stir until coated & lightly toasted; approximately 2 minutes. Add 1 cup of wine & let reduce, stirring constantly, cook until it reduces & there is very little liquid left. Ladle in ½ cup stock at a time, stirring & adding more stock as it is absorbed into the farro. Repeat until all stock is used up. Add the remaining ½ cup wine & continue to cook until the farro is al dente 12 – 15 minutes, adding more stock until it is; season to taste with more salt if required & freshly ground black pepper. Add the cheese & butter, stirring until incorporated. Serve immediately. **A note about Farro Perlato. I have, so far, been unable to find pearled farro in Vancouver, so I buy it in Italy & in London at an Italian Deli. You can easily find the regular farro, but for making risotto with regular farro there are two schools of thought on the preparation method. One is to pre-soak & one is not. Both methods are below & you can decide which one works for you. OR: sauté the onion & garlic as above, add the unsoaked farro, stirring for a minute to coat with oil & butter, add 1 cup of wine & reduce, stirring constantly, add 1 ½ cup hot broth & ½ tsp salt, stir to combine; bring to a boil, reduce heat to medium-low, cover & simmer about 10 minutes, until most of the liquid has been absorbed into the farro. Add remaining ½ cup of the wine, boil over medium heat, uncovered, until tender adding more broth ¼ cup at a time, stirring occasionally, until farro is al dente, approximately 25 minutes, the farro should not be dry. 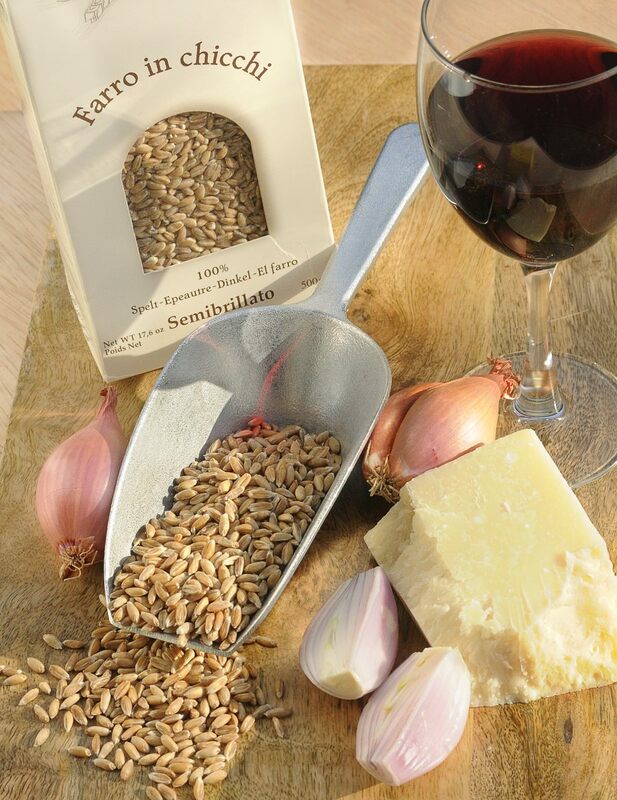 Season farro to taste with salt & pepper to taste, stir in the cheese & butter until creamy. I like to make this rice, a baked “risotto” to accompany Osso Bucco. It’s not the usual cooked on top of the stove, stirring almost constantly, so it does make things a little easier for the cook. However, feel free to change it up & do it the traditional way! I love the saffron in the rice. When buying saffron, make sure you buy the “threads” and not powdered. Spain’s saffron is excellent & if you can get it so is the saffron from San Gimignano in Italy. I like to use Parmigiano but Grana Padano will also be very good. To Finish The Rice: add 2 Tbsp. unsalted butter & 2 Tbsp. freshly grated Parmigiano-Reggiano. Add the saffron to the wine & set aside. Bring the chicken broth & keep warm. In an ovenproof pot, melt the butter with the EVO over medium to medium-low heat until hot. Add the minced onion & sauté until transparent, approximately 8 minutes. Add the minced garlic & stir for a minute, then add the rice & stir until it is coated with the butter & oil and the very tips of the rice grains begin to look transparent. Add the wine, stirring for a moment, followed by the broth, bay leaf, salt & pepper. Fit a piece of tin foil over the pot & top with the lid. Place in the oven and cook without looking, for 20 minutes; check & if the rice is still slightly creamy, it will be done. If not, replace foil & lid and return to the oven for a further 5 minutes. Remove from the oven, stir in the 2 Tbsp. butter and 2 Tbsp. Parmigiano-Reggiano. **If you would like to read about rice for risotto, please go to Phyllis’ Kitchen/Cooking Tips. **If you would like to make your own homemade stock, please to go Making Stock. This version of polenta is basically one that requires very little stirring; a good thing in my eyes! **If you like you can put a bit of fresh thyme in the polenta while it is cooking. In a 3 quart heavy saucepan bring the water to a boil, add the salt. 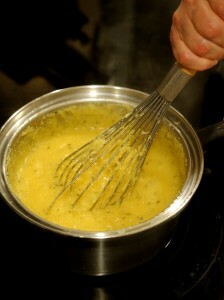 Whisk while adding the polenta in a thin stream. Cook over medium heat, whisking, 2 minutes. Reduce the heat to low; cover pan, then cook at a bare simmer for 45 minutes, stirring with a long-handled spoon for 1 minute every 10 minutes. Remove from the heat, whisk in the butter until incorporated. **Polenta can be made 20 minutes ahead, kept, covered, at room temperature, if you allow it to stand longer it will solidify. I made this polenta the first time on a rainy November night and served it alongside braised lamb shanks. It was the absolute perfect thing to accompany the lamb. 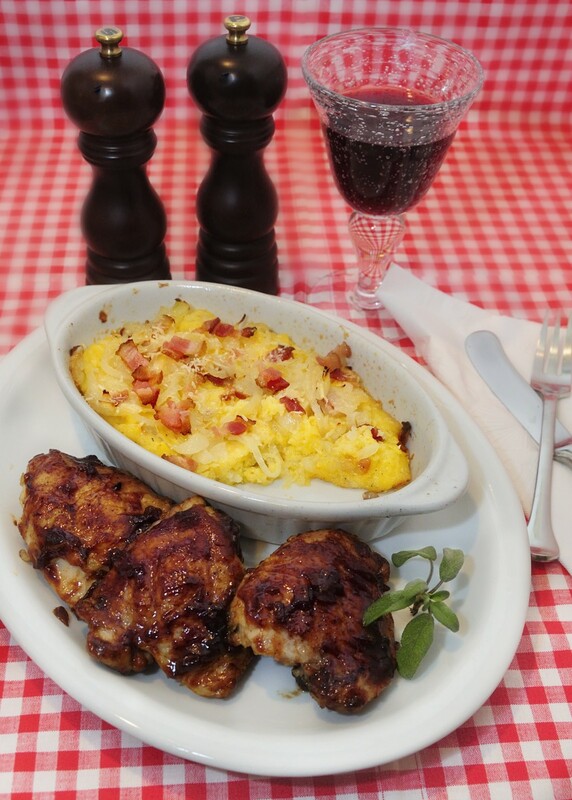 But, don’t hesitate to serve with steak, chicken or pork. How about grilled Italian sausages or Italian sausages braised with bell peppers, onions & tomato sauce? Go vegetarian and leave out the sausages. Add some zucchini or eggplant. Sounds good to me! Bring broth, thyme & garlic to a boil in heavy large saucepan. 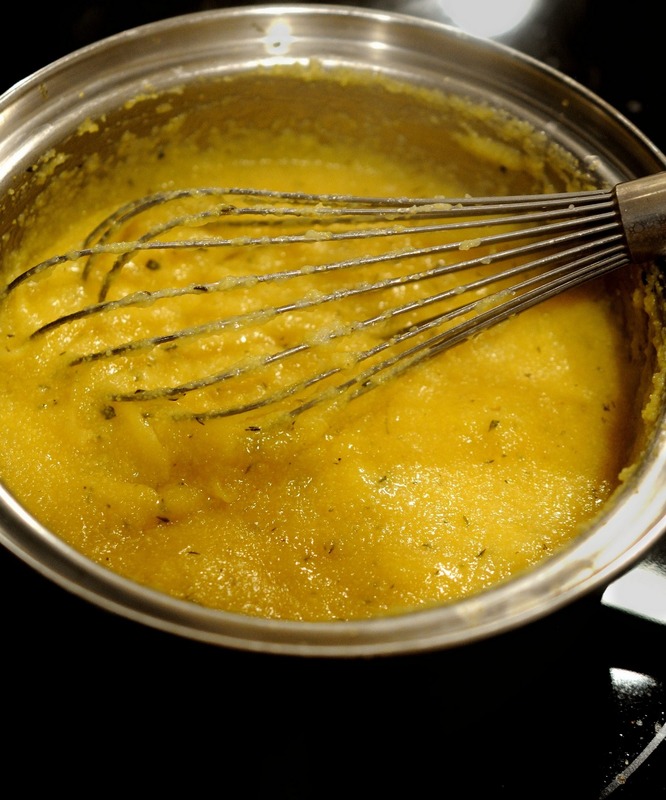 Gradually whisk in the polenta. 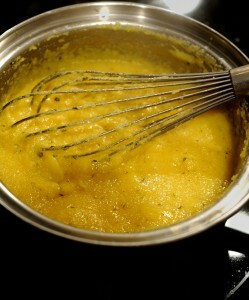 Reduce the heat to medium; cook until polenta is thick & creamy, whisking frequently, about 20 minutes. Add cheeses. Stir until melted. Season with salt & freshly ground black pepper. Serve immediately. 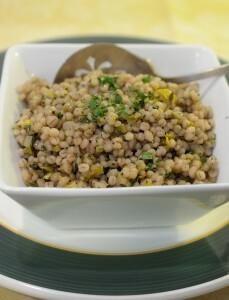 This couscous would make an excellent accompaniment to Lamb. Bring water, butter, lemon juice & salt to a boil. Remove from the heat. Add couscous & peas; cover and let steam for 5 minutes. Fluff with a fork. Toss with remaining ingredients & serve. **If you would like to see how to toast almonds, please go to Toasting Nuts.